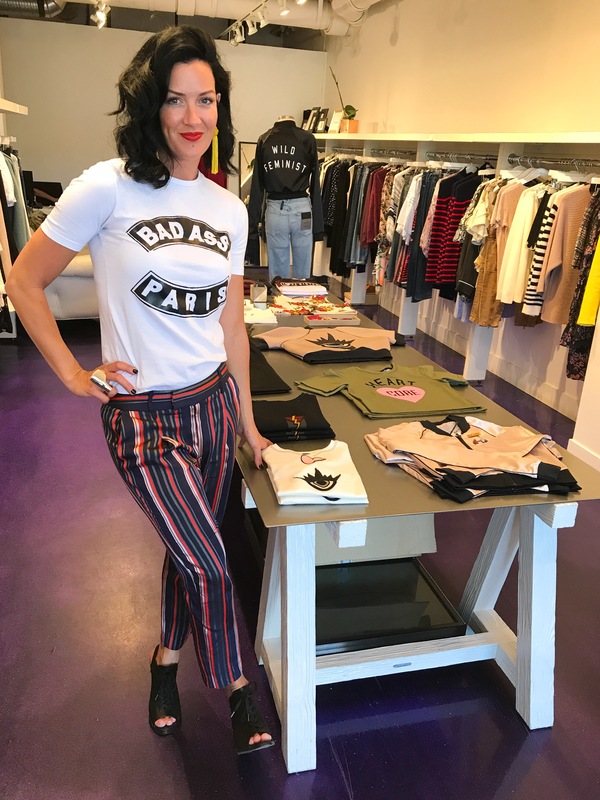 New up and coming Canadian fashion designer,Jennifer Mehalko, recently launched her first collection.Parts + Laboris a series of limited edition apparel capsules, rooted in themes of design and movement. Jennifer was one of the founding partners and designer of Calgary-based fitness studio ‘The Sweat Lab’, where she lead yoga and spin classes. With over 15 years of interior design experience and over 10 years of teaching under her belt, Parts + Labor became the next step of Jennifer’s exciting journey. A reflection of her rich history, each piece embodies design and movement. 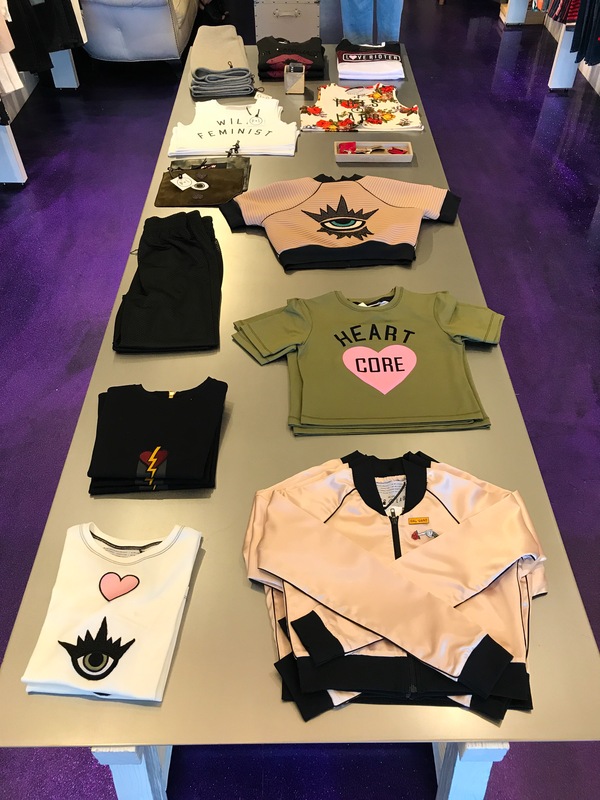 Designed and made ethically in Canada, the current Heart – Work Collection is a ready-to-wear luxe athletic line of 15 pieces. 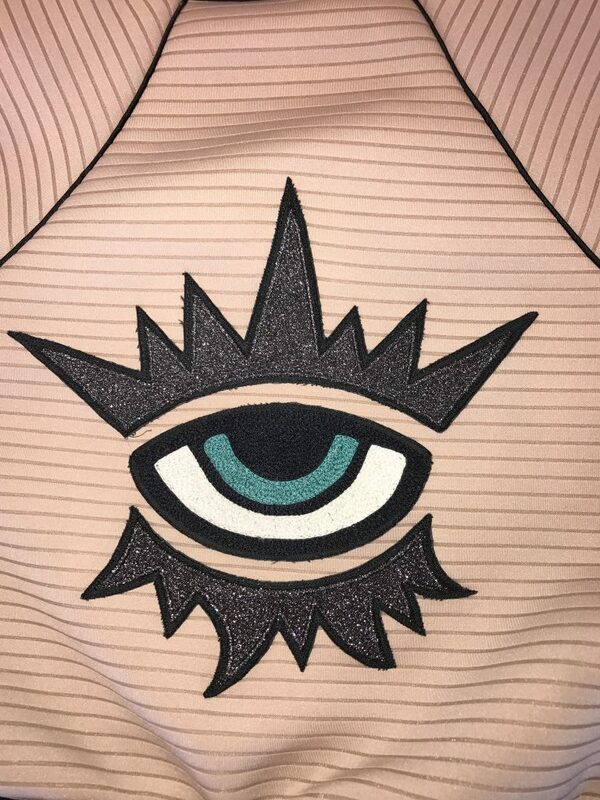 The Heart-Work Collection holds deep symbolism with evil eyes and hearts. 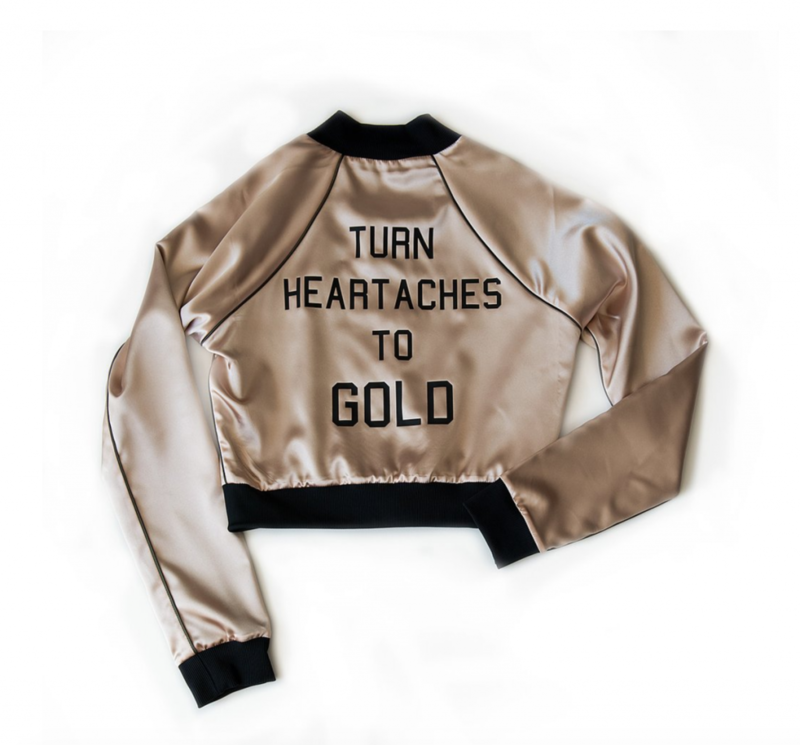 There are also great powerful messages on bombers and crop tops like “Wild Feminist” and “Turn Heart Aches to Gold”. Parts + Laborfounder,Jennifer, believes in authentically creating pieces that inspire, instill confidence + cultivate originality. Jenniferwants her collection to serve as a catalyst for something so much bigger than the tangible. It’s all about collaborating with creativity and living that elevated life. I am always so impressed and inspired when I see women going for it and creating something beautiful while fulfilling their dreams. It take a lot ofchutzpah to risk it all on your dreams and go out and support other women who do the same. JM: It was really important for me to be hands on – I had a lot to learn going into this + wanted to be able to dig in + be involved every step of the way. To be able connect with the pattern maker, the head of production, the sewers, the warehouse guys + everyone in the work room, in person, shifted the process quickly from it being about ‘my learning process’ to realizing the process was really more importantly about connection, support, growth + local sustainability. Everyone who was involved became a part of the story + it was incredible to have them a part of the process + acknowledged for everything they contributed to make it happen! KO: Who is the designer who inspires you the most (past or present)? JM: Currently, GUCCI. With Alessandro Michele at the helm as creative director their last 2 seasons have been incredible. 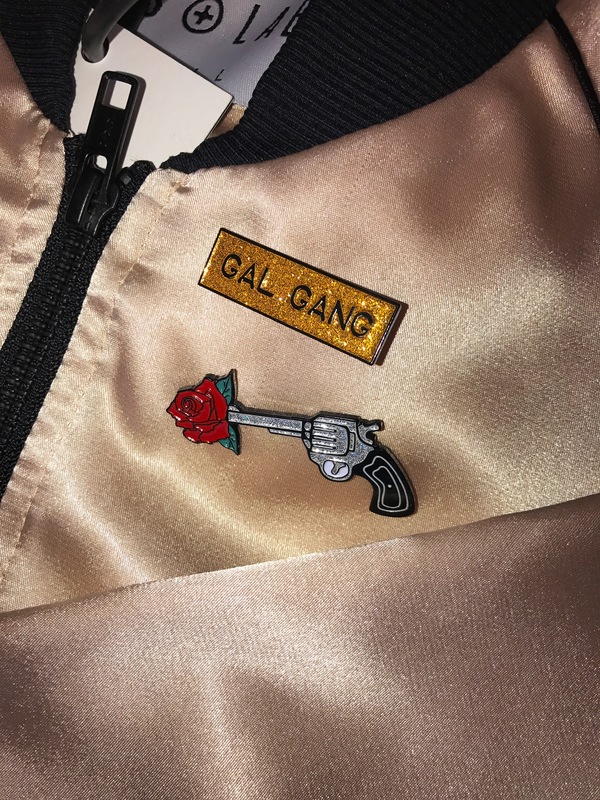 Their artist collaborations, messaging, boundary breaking… it’s what fashion dreams are made of. It is so inspiring to see a very classic, once relatively conservative brand taking some major risks. KO: At what age did you decide you were going to design fashion? JM: In my baby book, I scrawled ‘designer’ as my first grade career choice for ‘when I grow up’. I think living + working in a creative field was an obvious path for me – I battled my mom’s outfit picks for me at a very early age + although my career started in interior design – textiles, design details + creativity have always been a part of my life. JM: I think this goes way back to first or second grade, I was blessed to have women in my life; a great grandmother, grandmother + mother, who all loved fashion + who were known in their communities for their positive, beautiful confidence, always very put together + exuding the power of a positive woman. I think my favourite memory was in the summer weeks I spent with my grandma – getting lost on the floor of her closet, going through her clothing, jewels, scarves + picking things out for her to wear. I think for me then was the realization that tangible things could be used to express yourself from the inside out. KO: How did you start making fashion? JM: I have been styling, revising, collecting, sketching + idea collecting for my entire life. Instead of piano + swimming lessons as a kid, I was in sewing + art classes. JM: haha – does the goonies count?! I’m not much of a film buff!! KO: Who is your favorite director? JM: What are the staples of your own wardrobe? JM: I am obsessed with Canadian artist Zoe Pawlak – I have followed her for the last several years + am so inspired by the strength of femininity in her pieces along with her diversity. She’s collaborated in so many different modalities. I also had an opportunity to travel to Colombia a few years ago + have to say that the Colombian graffiti is insanely inspiring. Bogota condones graffiti in their streets + it a true testament that sometimes you don’t need a piece hanging in a gallery, or a boutique to share your talent, a reminder to our communities to look up + out for inspiration. KO: What decade of fashion has influenced you the most in your own designs? JM: I’m an 80’s baby + love that this decade that has been weaving it’s way back into fashion in the last couple of years. KO: Who was your biggest source of encouragement when starting Parts + Labor ? KO: What advice would you give future designers? JM: trust your guts + your heart + pull the damn trigger. The creative process can be eternal + relentless, you can revise + rework forever. Trust your vision, your resiliency + believe in what you have to offer. JM: Slightly! I am a believer of karma, universal energy + symbolic magic for sure!! You get what you give. JM: Messy!! sketches, photos, quotes, fabric swatches, books + magazine tear outs … everywhere! KO: Where do you create ideas for your designs? JM: I take a sketch book with me wherever I go + I feel like my best ideas come while travelling. I sketched 80% of the first collection on a flight from San Fran to LA. At home, I have a design studio also filled with things I love, (my pups included) it’s my favourite space in all of the homes we have lived in – easy to get lost in a creative storm up there! JM: It’s evolved in terms of my buying habits. 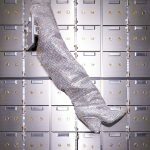 I used to be quick to make a purchase – really it was fast-fashion-get-in-my-closet-for-now type buying. I have always loved pieces with a story, whether from travelling, or something that has touched me in terms of a brand’s intention – and now I ask more questions + get curious about where pieces come from. I also will save up to invest in great pieces that I really am obsessed with + wear the heck out of them rather than let them collect dust in my closet. KO: Where do you ideally see your collection in 7 years from now?